You may have recently spotted a metallic-adorned shoulder blade, wrist, or inner arm and wondered: What is that? You're looking at Flash Tattoos, graphic gold and silver temporary tattoos (not to be confused with glitter tattoos, which got me excited when I was 12—or the metallic tats that Dior once made and were sadly limited edition). I recently partnered with Stylemoi and we are giving this beautiful set that includes 4 amazing flash tattoos worth USD$29.99 to you for FREE. Just sign up here and you only need to cover the international shipping fee of $3.99! Plus, you could win $100 coupon a week! 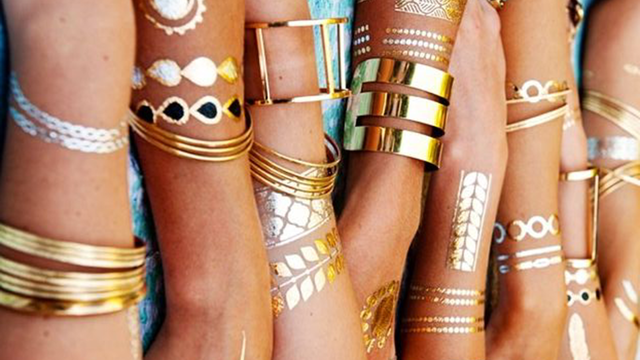 Just show us your flash tattoos with the hashtag #stylemoi on Instagram, Twitter or Tumblr. Never tried them before, looks exciting though. A great and practical solution to replace the permanent tattoos. Nice tattoo,esp when it summer! What fun for summer, I've seen them but never on someone I love the look! Definitely getting them! I like the look of them a lot and think it's great to have such a temporary option. However, I am allergic to SO many things I'd be a tad hesitant to try them...otherwise, I definitely would. I never know if a style like this will look good on me and I'm always to apprehensive and short on money to dive into a new trend. Sometimes I wish I did though, since these look so wonderful. I love that denim is coming back in a good way!! Perfect for summer! I love this look! I love these tattoos and they are beautiful looking. Those are so pretty and seem like they would be really fun. I absolutely love these. I love that they are temporary and they have the cutest designs! I love these - I would think they would look great with a summer dresses. A little sparkle and shimmer for summer! hope to try them soon! They are cute but I am too old for them. However, I have a niece who would probably love them. I'd really love to try 'em out! These are so pretty and modern, can't wait to try them! Love this packsack! Would totally love to win it! these look super fun adn trendy! i have seen them on many at the beach at the mall lately! These look really nice!! I have seen them around!! I love these! They are awesome and don't leave marks like actual Jewry. This is AMAZING! Thank you for the chance! These are very cool! I've seen them a lot this summer! Love your site! Great style. Never tried tattoos before, looks great! Great tattoo's, they look like jewelry. My teenagers would love these! I love them! They are so beautiful! I especially like the Native American symbolism of the jewelry and tattoos. Great to wear anywhere and for age groups from 14 on. I would love to use removable tattoos. A great look, but not permanent. These are SO cool! Must. Order. Like. Now!! beautiful tattoos ^0^ would try them for sure! These are so cute! Never tried them before. I really felt like a blast from the past with some of these things. I showed my daughter and she liked all of these things. I love the look of these. Very cool. Great idea. These really look like fun. My first time to visit your site. It's a lot of fun. These are like temporary tattoos for grown ups! Very cute and not pernament! Love it! Beautiful and nice of you. Not being stuck forever w/ one look is perfect! Very interesting and perfect for summer ! These are super unique! I love them! Look good, I love them! I love those for the beach/pool. and not have to worry about losing favorite jewelry! This tattoo looks good! I wanna try them! Completely adore these! Perfect for summer fun on the beach. Completely adore these! Perfect for late-night summer fun. I haven't tried them before but I am looking forward to because they're really cool. awesome site, amazing clothes...wish me luck that i win something....regardeless will be back shortl to shop!!!! me likey!!! New fan & loving it! Thanks so much for the chance to win these gorgeous items!!! Great - really pretty and different. Very artistic designs. Tattoo fans would really find this amazing. I like how metallic these are. These are so cool! Thank you for sharing. I would like to have these! Never saw tats like that before. Actually I am not a fan of tattoos at all, however I have seen these really tastefully places and they are pretty. So these have changed my mind as long as they aren't permanent. And my daughter would love them-she's 19. Generally I'm not a fan of tattoos but these are really pretty. Thanks for sharing. Thank you for sharing these amazing tattoos! They look awesome. I think that they would be neat to try out. Love these. Great addition to a fun night out. Y'all have some of the most AHmazing giveaways i swear! And I just had some of these in my hand at Sally's ready to buy, but they just weren't in my budget. But I think they're cooler than a fan! All the prizes of all the giveaways are, too! Thanks for the chance! Have not tried those yet, nice! I have several tattoos myself & I think these are so cute! Love the look! I love the cuff bracelet and the bag. I just love all of these bags! I am entering all of these contests! Wow! A great new way to accessorize.